WORK has started on delivering one of the key projects identified in the Coffs City Centre Masterplan with the $2.5 million revitalisation of City Square now underway. Contractors QMC Group have been appointed to complete the revitalisation project, which is funded through a Special Rate Variation, paid by property owners in the Coffs CBD. Work started on the project this month and it is expected that the project will be completed in August this year. City Square designs were finalised last year, following extensive consultations with property owners, traders and the wider community. Key elements of the City Square project include: CCTV security, contemporary lighting, event power supplies, new paving, 13 large cafe umbrellas to replace the existing arbours, new public seating, communal tables for shared dining experiences, raised Shared Zone on Park Avenue Lane to improve pedestrian safety, timber-look stamped concrete paving and upgrades to the western kiosk. Sydney-based QMC Group has completed numerous projects similar to the City Square upgrade and has significant experience in working with businesses throughout construction. Works will be completed in stages, to minimise impacts and to maintain business access. The Coffs Coast Growers Markets will trade as normal throughout the construction period, every Thursday from 8am to 2.30pm. 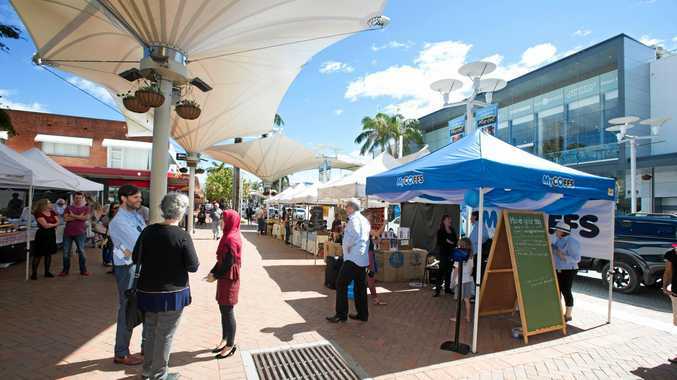 Stalls will be temporarily relocated along Harbour Drive, close to City Square - find updates and stall locations on @coffscoastgrowers Facebook page. A project office has been set up in part of the contractor's office in City Square. Project officers will be available between 10am - 3pm weekdays to answer quires from the public and local business through the duration of the construction.